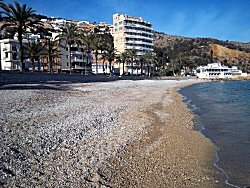 Javea is a popular tourist location and has been described as the jewel of the Costa Blanca with its dramatic mountain backdrop. 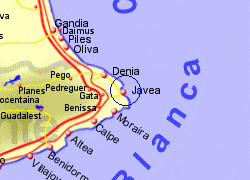 The old town of Javea is set back from the coast and is where you will find narrow streets and original whitewashed houses. 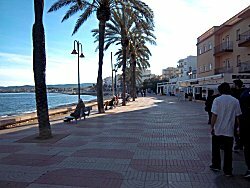 On the coast is the relatively small blue flag Arenal Beach with golden sand sloping gently into the sea (most of the rest of the bay being rocky or pebble beach) and a promenade lined with bars and restaurants. 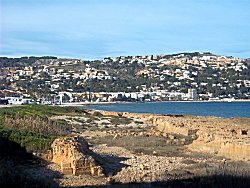 Just north of the Arenel beach is the port area, still a working fishing port, where you will also find shops, restaurants, tapas bars and fishing boats. 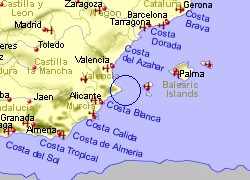 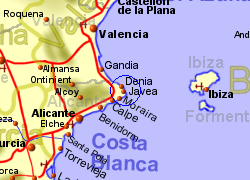 Map of the Javea area.